Welcome to my first blog for ProjectorCentral. For starters, I want to thank editor-in-chief Rob Sabin for coming up with such a great name for the column, and for giving me a forum where I can share my experiences and observations on a wide range of projector-related issues. He and I go back quite a few years—and yet he still took the risk of letting me speak my mind. That said, I thought I’d start out with a short history lesson designed to give you a better understanding of how dramatically—and rapidly—the projection and film industries have changed in the three decades I’ve been testing projectors and other imaging products. Once upon a time (1987-1990) I worked my way through college (Rochester Institute of Technology) as a projectionist for Eastman Kodak’s Program Services division. The job involved driving a 20-foot truck around the country for months at a time, and in more than 50 cities setting up and running a “multimedia extravaganza” show on a 12 x 36-foot screen for audiences ranging in number from hundreds (camera clubs) to several thousand (civic centers). The shows were visual documentaries centered on different countries and photogenic places, and each took Kodak months to create. Production involved teams of pro photographers shooting on location (including in China in 1986), followed by hundreds of man-hours spent in darkrooms and processing labs creating the masks and duplicating slides needed to fill custom layouts or giant 12 x 36 panoramas on screen. The Kodak Ektagraphic Pro slide projectors used were all fitted with custom 210mm Navitar lenses (Navitar is still in business! ), and attached by wires to a bank of dissolve units and timers each synced to a master show controller. This was definitely not your average slide show—as you can see from the newspaper clipping. The author in 1987, setting up an elaborate multimedia show for Kodak. For me and the show host (usually a Kodak pro photographer), each location was a different challenge, with the setup usually taking an entire day to complete and a half day to break down. 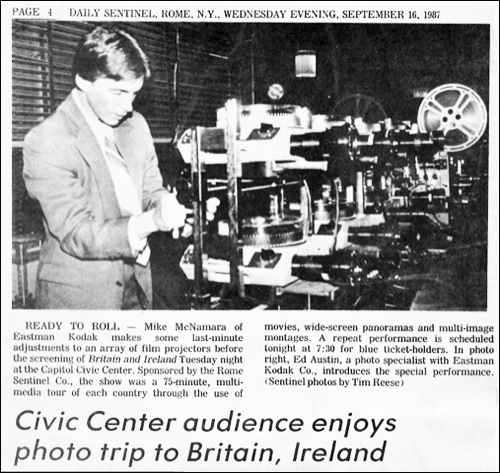 Every show was also an adrenelin rush, as my task was to manage a 35-mm movie projector and bank of 16 slide projectors (8 on each side of the movie projector) during one- to two-hour long shows containing thousands of slides and multiple movie reels. As the audience sat enthralled by the images appearing on screen, I secretly swapped out slide carousels at least twice for every projector—and even changed random blown bulbs—without shaking the racks or causing a black window on screen. Well, most of the time. I had my share of blown fuses (notorious in old theaters) and near simultaneous bulb failures to deal with at opposite ends of the racks. Despite those occasional gliches, the audience always got what it paid for—the ultimate multimedia visual experience available. That’s the way Kodak promoted the shows, and it was correct. Consider that at the time, IMAX movie theaters didn’t exist, and tiled LCD walls and 4K HDR commercial projectors were more than 20 years away. In fact, it wasn’t until recently that any display or projection technology was readily available that could match or exceed the color gamut, detail, dynamic range, and overall image quality of projected slides in a dimly-lit theater. As a side note, the shows got people so fired up about taking pictures (that was the secret mission) that film sales skyrocketed at local camera stores for weeks after the Kodak shows came to town. Unfortunately, no one in Program Services kept an accurate track of the increased film sales, and in 1991 the Kodak bean-counters shut down the tours (after 30 years) in order to save a few dollars. For my part in the show tour, Kodak paid me $300 a week and covered my expenses. Plus I got all the film I could shoot in the hours I had off while on tour, and got to learn an incredible amount about the photo industry in the U.S. After graduation and a short stint teaching at R.I.T., I spent the next 17 years as an Associate Editor and then the Executive Technology Editor at Popular Photography Magazine. My gig there was testing and reporting on new color films, film projectors, printers, digital cameras, scanners, imaging software, and even computer monitors for retouching. I noticed that Kodak stopped introducing new slide projectors in the late 90s, after many pro photographers transitioned to digital SLRs and slide film sales plummeted. Within a few years, print films followed the same downward trend as prosumer digital cameras became more affordable. 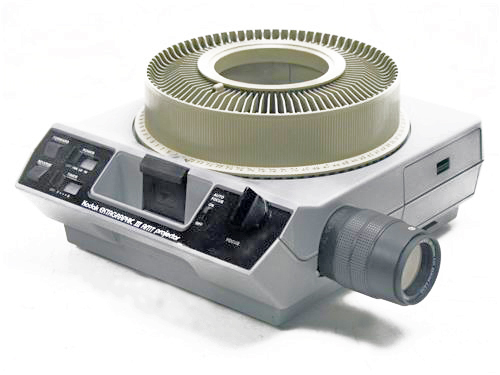 Noticeably missing from product reviews at the magazine were any digital projectors, because none could deliver the image quality required by any serious photographer (or video content creator) for showcasing their best work. We've come a long, long way since film movie projectors and slide machines like the Kodak Ektagraphic represented the top of the imaging food chain. From my perspective, digital projectors actually took until recently to reach or exceed the image-quality bar and affordable price point set by film projectors. Now, for about the same price (in today’s dollars) that a pro Kodak Ektagraphic projector with a good zoom lens once cost in 1990, you can purchase a single 4K projector capable of handling both still photos and movies, with a wide color gamut attaining or even exceeding Adobe RGB or DCI-P3, more accurate colors, and higher dynamic range than any slide film and projector combination could achieve. Michael J. McNamara is the former Executive Technology Editor of Popular Photography magazine and a renowned expert on digital capture, storage, and display technologies. He is also an award-winning photographer and videographer, and the owner of In-Depth Focus Labs in Hopewell Junction, NY. In The Projectionist, he shares his field experiences, insights into current products, and tips and tricks for improving projected image quality for SDR and HDR content. What a great start! I still have those exact projectors and even used Navitar lenses to produce "3 projector" shows using an Entre programmable Dissolve unit. I guess everyone has a story, eh? I now use Dataton's Watchout. Really looking forward to your future articles Michael. This one certainly caught my attention! Lloyd: Thanks for the comments and compliments! Didn't mention that before projecting for Kodak I got my feet wet using a 3-projector dissolve unit (circa '85 to '87) while working for the Archdiocese of NY. That simple dissolve unit was the state-of-the-art in "digital" devices at the time and raised slide show engagement significantly--meaning fewer viewers fell asleep. Wow, what a great experience working for Kodak. Long before "Home Theatre" was the big buzz word in todays digital age, I started out in Super 8 film. I shot a lot of Claymation, (stop motion animation). I also collected a lot of Castle Films shorts, these were abridged versions of movies than ran about nine to ten minutes. Then I graduated over to 16mm film. I shot a lot of sports footage at the local college and I would set up the projector so the coach could critique the post game to the players. I also worked at the local movie theatre running 35mm projectors. So projectors have been my love affair since childhood, all the way up to todays digital technology. I enjoy Projector Central, you guys do such a wonderful job!